Speed up laptop's operationThe 2nd hard drive caddy brings you new maximum data storage flexibility, which can speed up system's operation. Simply removes your CD-ROM drive and put the Caddy added hard drive in its place. 2 hard drives, larger capacity and faster speed. Equipped with SATAIII, ORICO L127SS makes your hard drive give play to high performance, improving the starting and read-write speed. Two-channel switch prevents part of laptops from being not compatible. Whether Lenovo, Asus, Dell, HP or Acer, laptops with 12.7mm CD-ROM optical bay are supported. ORICO L127SS fixed by multiple screws is made of aluminum magnesium alloy with texture. lightweight, solid and easy to dissipate heat. Built in screwdriver to fix hard drive, easy to disassemble laptop, suitable for 5 / 7 / 9.5 / 12.5mm HDD and SSD. 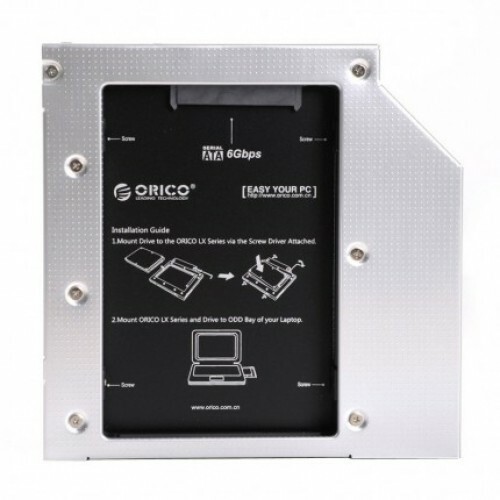 ORICO L127SS supports most laptops with 12.7mm CD-ROM optical bay, such as Lenovo, Asus, Dell, HP, Acer and so on.